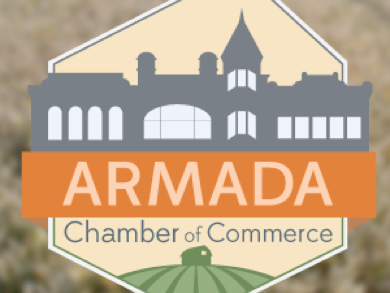 The object of the Armada Area Chamber of Commerce is to promote and advance the general welfare and prosperity of the residents and businesses of the greater Armada area. We will sponsor annual festivities throughout the year for the Armada area residents and businesses alike to participate in creating enjoyable memories to share and last a lifetime. From springtime’s Art-Mada that pairs local artists with local businesses to create a day of shopping and exploring the best Armada has to offer, to fall’s Armada-Geddon, our Halloween festival complete with nighttime parade, we will have many events that showcase Armada’s talents. We meet the first Tuesday of the Month in the basement of the Armada Corners building in Armada at 7:15 p.m. The chamber is open to any individual, association, corporation or partnership in the Armada area. The only requirement for membership is having an interest in making Armada a better place. Annual dues are $100 for businesses, $50 for non-profits and residents.